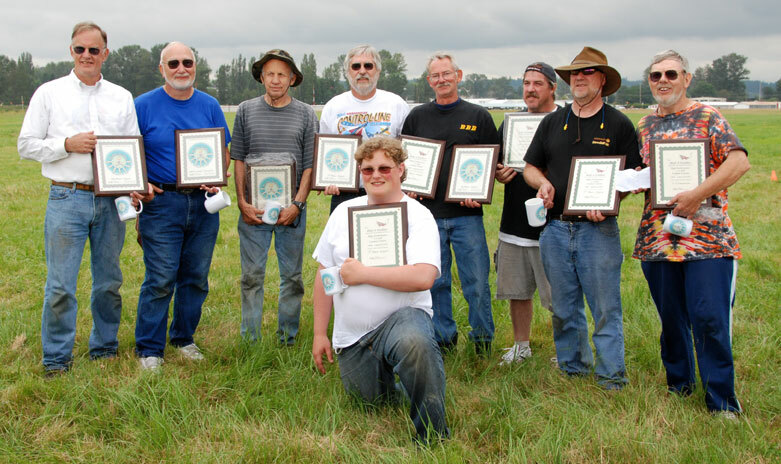 Seven-round Fast Combat tournament, Aug. 7-8, Snohomish, Wash.
All the placing pilots in the 2010 Bladder Grabber and the 1/2-A Grabber (from left): Jim Green, Gene Pape (Bladder Grabber winner), Steve Stewart, John Thompson, Jeff Rein, Jeff Dawson, Ken Burdick, Mel Lyne (Half-A Grabber winner) and kneeling, Tristan McKay. Tony Huber photo. 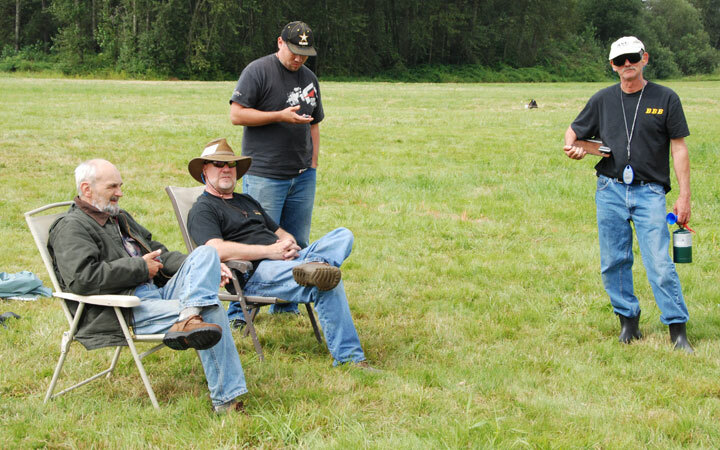 The thirty-second running of the world's most prestigious AMA fast combat contest drew 19 contestants to Harvey Field in Snohomish, Wash., for what may be the last "big block" fast contest, in view of proposed changes to AMA rules that would reduce the engine size. Grabber XXXII showed why fast remains the top-gun combat event: It's bigger, it's faster, it's louder, it's just, well, more! Contest Director Jeff Rein reports that the contest entailed 75 matches, many of them true combat showcases. There also were plenty of crashes and bashes. Three planes were cut loose, with line-tension shutoffs functioning immediately and planes coming down near the circle. The weather brought in cool air and rain on Saturday, but the contest continued smoothly. Overcast gave way to sunshine on Sunday, with no rain that day. The new seven-round format was a success. All contestants flew seven rounds, after which the records were examined. Gene Pape of Eugene, Ore., was the clear winner with a record of six wins and one loss. Five other contestants had records of five wins and two losses. 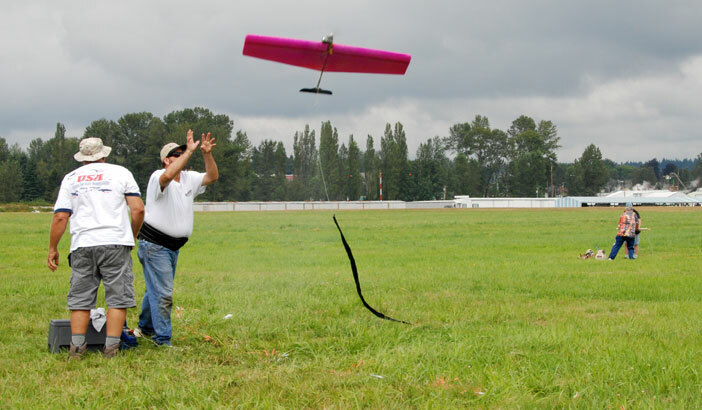 A flyoff then determined the second through sixth places. 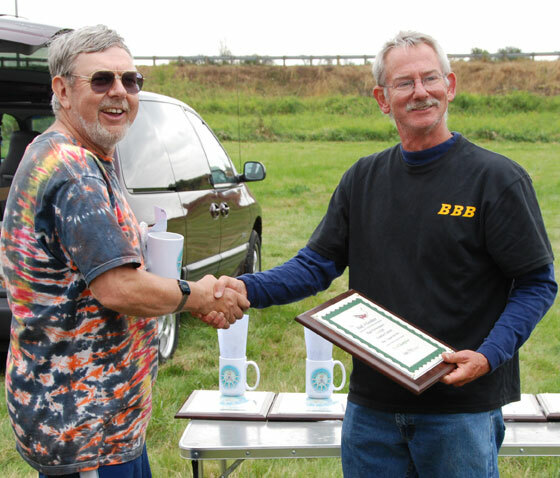 All the top fliers received cash prizes -- $1,000 to the champion Gene Pape -- along with plaques and commemorative mugs. Friday's Half-A Grabber drew 15 entries, with many fliers calling it the best 1/2-A contest they've ever attended. There were many great matches, mostly ending in kills, in the double-elimination format, with Mel Lyne ending up the winner. 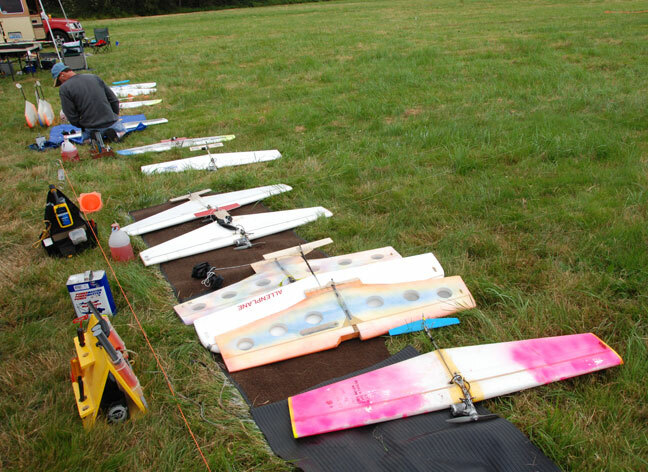 Nineteen contestants came out last weekend to fly what probably will be the last big block AMA 328 Combat contest in the world! And boy was it a good one. Attendance was up 25% over last year with contestants from Michigan, Arizona, Texas, So-Cal, the Bay area, Oregon, Washington, and the Alien came down from B.C. We chose a seven round format this year for one reason. If people want to fly fast combat, then everyone who comes to the contest are going to fly all day, both days. Two rounds were flown in the morning before lunch in mild cloudy weather. The contest opened up with back to back current national fast combat champion Don the combat Monster McKay, flying two time U.S. combat team member and combat legend Ronnie Colombo. Chasing all over the sky they flew with out a cut. Ronnie runs out of fuel. Don gets precious air time and takes the lead. Ronnie refuels and when the horn blasts, Ronnie, down on points jumps across the top of the circle and cuts a good chunk of streamer off of Don's plane to take the lead. The match heats up like a furnace and non stop action continues until a collision ends the match, about four minutes into the brawl, resulting in a win for Colombo. The opening match turned out to be one of the best all day. We flew 20 matches in the morning, followed by lunch which was provided by a fund raiser run by the Johansens. Lunch was paid for both days by the Grabber management. After lunch an annoying drizzle, rainy pattern persisted the rest of the day. The matches got a little sloppier and enthusiasm went down a bit. Most were content the day ended by 4:30, a half an hour ahead of schedule. Sunday was a different story. The weather was overcast and mostly short sleeve weather. At the start of combat on Sunday, everyone except 2 people were in the running to place in the money at this years Grabber. Everyone seemed to love the new seven rounds format. Going into the seventh round it looked as if we might have as many as eight people with a chance of winning the Grabber, but by the fourth match Gene secured an unbeatable score with his sixth win. By the end of the round we had five contestants to fly off for second through sixth spot. Steve took a bye. Mike and I fought hard in a clean match with me getting a kill for the win. John Thompson beat Jim green. Now it was my shot against John to win a chance to fly in the match determining second and third place. Shortly into the match I flipped inverted and my motor shut down. While I was gliding dead stick, John in a quick move avoided hitting my helpless airplane and taking my streamer for good measure. Match over. Upon further inspection I found that my bellcrank mount fractured causing the shutoff to trip. Good thing too because I also found a fractured pickle fork motor mount. When my stuff breaks, it really breaks! Beavers took away $1500. Bod Busters took away $150. Does that mean that the Beavers are ten times better than the Bod Busters? Time will tell. On another note there were three fly-away's, all of which promptly shut down like they are supposed to. For the last five years we have required the use of line tension style shutoff's at the Grabber and I am happy to report that since that change there has not been one shutoff failure in the NW, and we by far lead the world in combat safety. This is an accomplishment that we can be proud of. 1/2A combat started with the first match at 12:30 Friday afternoon. In the past, 1/2A had not been one of my favorite events due to the fact most of the matches ended in line entanglements where the first one to crash loses, or ends in a collision. Friday was not the case. 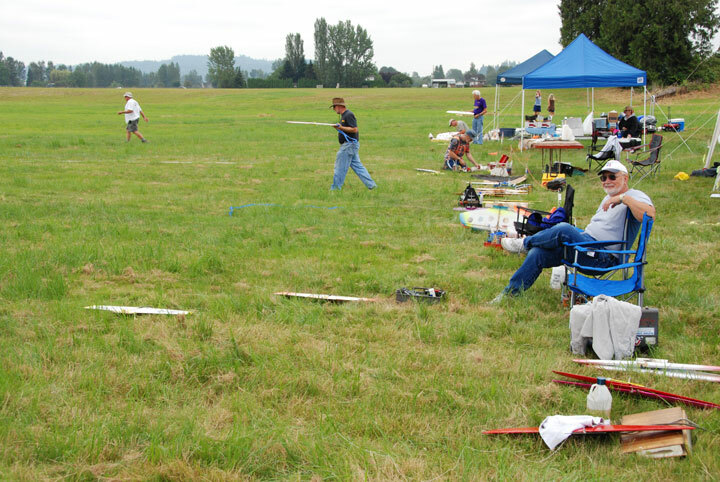 Most people who attended agreed that it was one of the best competitions ever flown in the Northwest. One main factor for this is that most of the planes that were flown were designed and manufactured by Jeff Dawson. If you can't beat it, buy it! We had 15 contestants competing, and all matches were flown cleanly with a majority of the matches ending with a kill. After four matches of the double elimination contest, Ken Burdick looked unbeatable, but with strong competition coming from Don Jensen, Mel Lyne, Jeff Dawson and myself, any one of us had a shot at the $500 prize. Going towards the semi-finals I gave Ken his first loss, which he promptly returned the favor in a very exciting and entertaining match, sending me to fly for third and fourth. Mel put the kill on Dawson setting up a final with Mel and Ken, and Jeff and Jeff for third. Jeff and I flew a smoken match using all of the circle. He ultimately got the kill on me, taking third place. He was so thrilled that when his plane landed, he picked me up from behind in a bear hug, gave me a flying chiropractic adjustment lifting me up off of the ground, all while I continued to fly figure eights overhead. Look mom, no feet. 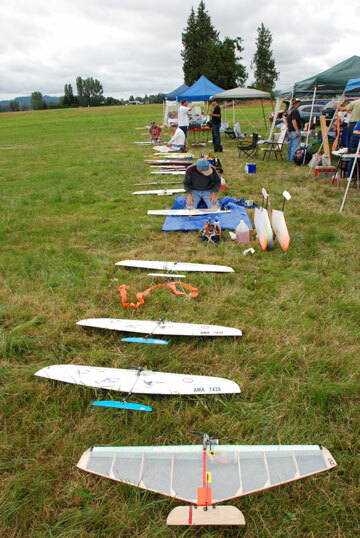 When it came to the finals, Mel was low on equipment and borrowed a brand new plane from Dawson. 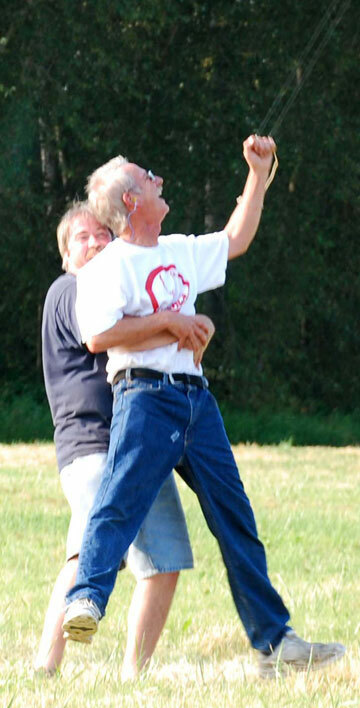 Ken was flying his backup Dawson, (We broke his #1 plane in the entertaining match I referred to earlier). After 30 seconds of the fastest tightest turning matches you will ever see, Mel got the kill on Kenny B and won the contest. Let's do it again! Before the flying began on Saturday, the eventual Bladder Grabber champ, Gene Pape, looking relaxed and ready. Flying Lines photo. Lineup of airplanes. Early in the contest, all pristine and undamaged. Flying Lines photo. Left photo: Bladder Grabber pit area on Saturday. Right photo: Combat action, Steve Stewart on the left, Kenny Johansen on the right. Flying Lines photo. 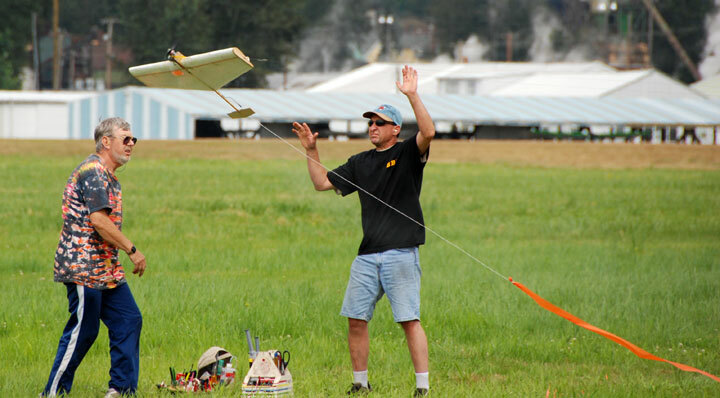 Steve Stewart's plane flies out of Don Jensen's launchg as starter Jeff Hanauer steps aside. Flying Lines photo. 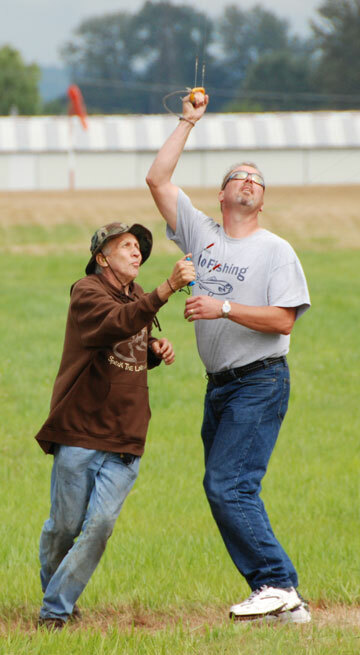 Lee Letchworth launches Kenny Johansen's plane as starter Mel Lyne watches. Flying Lines photo. The winning airplane, Gene Pape's Millennium Underdog. Flying Lines photo. It was a rough weekend for second-place John Thompson's equipment. 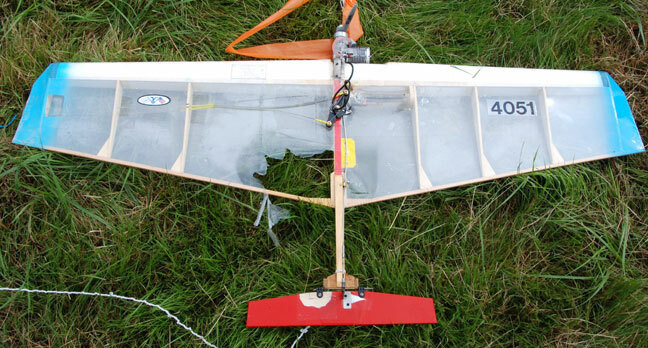 This Mejzlik Czech Fast was still flying well even after a big hole was knocked into it. Flying Lines photo. Judges at work, from left: Dave Fischer, Ken Burdick, Hector Artega, Jeff Rein. Flying Lines photo. 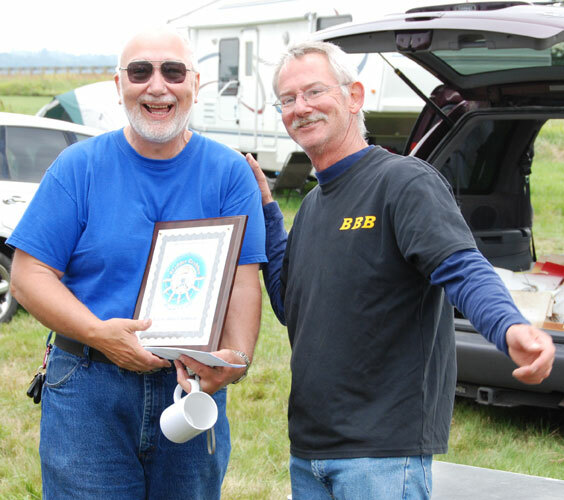 Happy champ Gene Pape gets his trophy and cash from Contest Director Jeff Rein. Flying Lines photo. Mel Lyne gets the prize for winning the Half -A Grabber. Flying Lines photo. 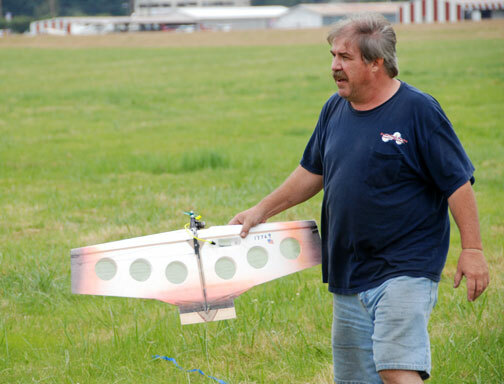 Jeff Dawson built most of the airplanes used in the Half-A Grabber and many of those in the Bladder Grabber. Flying Lines photo. 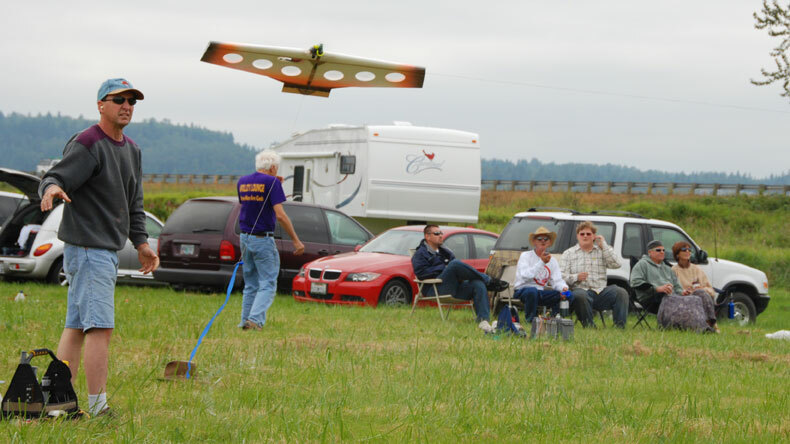 Lee Letchworth launches one of the Dawson 1/2-A planes. Flying Lines photo. 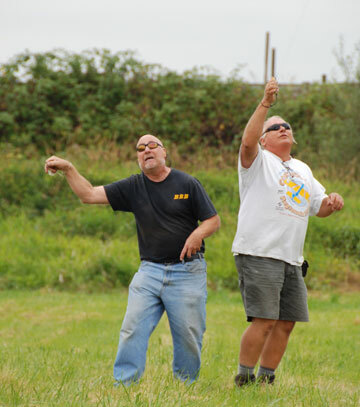 Left photo: Jeff Dawson (left) and Mel Lyne fly in 1/2-A action. 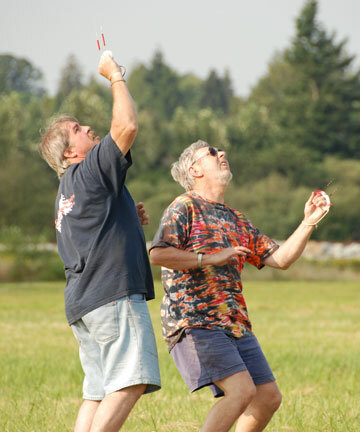 Right photo: Ken Burdick (left) and Jeff Hanauer duke it out. Flying Lines photo. Left photo: Combat action on 1/2-A day. Mel Lyne (left) and Ken Burdick jockey for cuts.Flying Lines photo. Right photo: Jeff Dawson lifts Jeff Rein off the ground after a match -- everyone had a laugh. Gene Pape photo. 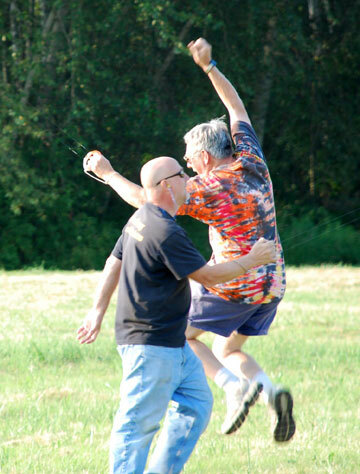 Nothing like the joy of winning a contest: Mel Lyne celebrates victory over Ken Burdick for Half-A Grabber championship. Gene Pape photo.